Stimulants are a group of drugs that result in increased activity in the body. Sometimes referred to as “uppers,” these drugs are frequently abused due to their performance-enhancing and euphoric effects. Generally, those who abuse stimulants experience heightened energy levels and enhanced focus. Stimulants speed up mental and physical processes, which can produce desirable effects in the short-term by increasing levels of dopamine in the brain. While users may feel great due to the short-term effects of stimulants, long-term abuse of these drugs can have significant consequences, which is why it is so important for those who abuse the drugs to get help as quickly as possible. There are both legal and illicit stimulants, and both categories are commonly abused. Some of the most commonly abused stimulants include cocaine, methamphetamine, and prescription stimulants, like Ritalin, Adderall and Concerta. Cocaine is one of the most well-known stimulants in the world. A highly addictive drug, it is made from and named for the South American coca plant. Cocaine usually comes in the form of a fine white powder, though the popular “crack” form comes as crystallized rocks. 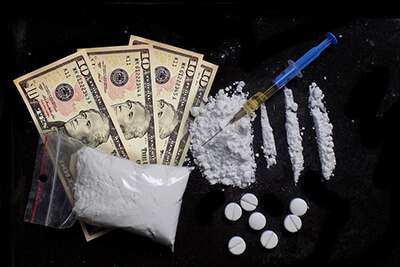 Cocaine and crack cocaine can be used via a multitude of methods; the most common form of ingestion for powdered cocaine is snorting the drug, and the most common method for crack cocaine is to smoke it. The average age for initial use of cocaine appears to be getting lower. A survey conducted by the National Institute on Drug Abuse (NIDA) in 2016 showed that 1.4 percent of 8th graders surveyed had tried cocaine in their lifetime, while 0.8 percent had used the drug within the past year and 0.3 percent in the last month. A comparison to the results from 12th graders in the same survey showed increased use with advanced age, with the lifetime use rate at 3.7 percent, past-year use at 2.3 percent, and past-month use at 0.9 percent. Oftentimes, childhood use of a substance translates into adult use. In fact, according to NIDA, adolescents who use drugs are more likely to develop substance use disorders than those who begin using drugs as adults. Since the brain is still developing throughout the teen and early adult years, it is particularly vulnerable to the formation of addiction during this time. Per 2015 NIDA information, more than 16 percent of surveyed adults 26 or older had used cocaine in their lifetime. Use of cocaine may initially start as simple experimentation, but it can quickly snowball into consistent abuse due to its addictive nature. According to the Foundation for a Drug-Free World, continued use of the drug can lead to increased tolerance. This means that more of the drug is required over time to produce the desired effects. Prolonged use can result in side effects, such as loss of appetite and sleep deprivation. People often go on cocaine binges, during which they may not sleep or eat for days at a time due to the suppressed appetite and lack of desire for sleep that often come with use of the drug. As with all polydrug abuse, combining substances increases the risk of adverse effects exponentially and the potential for overdose. Oftentimes, the effects of one substance mask certain effects of the other substance, making it more difficult to detect overdose. Users of methamphetamine can easily overdose, which can lead to extreme physical problems and death. Law enforcement appears to be cracking down on methamphetamine in recent years due to its rise in popularity. According to the Drug Enforcement Administration (DEA), methamphetamine seizures more than doubled from 2010 to 2012. Illicit drugs are not the only stimulants out there, as prescription amphetamines have become popular drugs of abuse in recent years. These drugs include Ritalin, Adderall, and Concerta. They are often prescribed to treat attention deficit hyperactivity disorder (ADHD), a condition that affects an individual’s ability to focus and control impulses. According to the Center for Disease Control and Prevention (CDC), 11 percent of people 4-17 years old had been diagnosed with ADHD as of 2011. While prescription stimulants can be necessary for those who actually suffer from ADHD, they are commonly abused by those without the disorder in an effort to improve focus or cognitive capabilities. They are often referred to as “study drugs” and abused by high school and college students who take them before cramming for finals or in an effort to manage the many demands of an active academic, extracurricular, and social schedule. According to the CDC, about 20 percent of high school students in 2009 admitted to taking a prescription stimulant without a valid prescription. Like other stimulants, Adderall, Ritalin, and Concerta can all be habit-forming drugs, leading to addiction over time. While each of these drugs is most commonly used to treat ADHD, they have other uses as well. Adderall is a combination of amphetamine and dextroamphetamine that can also be used to treat narcolepsy. Ritalin contains methylphenidate and is also used to treat mild depression and narcolepsy. Concerta also contains methylphenidate. While abuse of these drugs is most common among teens and young adults, once addiction takes hold, that use often continues for years. Students who are dependent on these drugs to manage robust schedules often continue to rely on them as adults to manage heavy workloads, family responsibilities, and busy social calendars. Long-term effects from continued abuse of these prescription stimulants include depression, cardiovascular complications, nausea, insomnia, stunted growth in children and teens, anxiety, hypertension, aggressiveness, and manic states. Continued abuse of any type of stimulant can lead to a substance use disorder. Once addiction has taken hold, professional care is recommended for the best chance at a complete recovery. Generally, medical detox is recommended for those suffering from long-term stimulant abuse, polysubstance abuse, or co-occurring disorders (when another mental health disorder occurs alongside the addiction). In a professional facility, clients are monitored around the clock while the drugs of abuse are processed out of the body. If any complications arise, medical professionals can act quickly. In addition, medications may be administered to address specific withdrawal symptoms, such as anti-anxiety or anti-nausea medications, to make the process as comfortable as possible. Supportive care in the form of proper nutrition, hydration, and encouragement is also given. While detox is an essential first step in addiction recovery, it does not constitute treatment on its own. It must be followed with comprehensive therapy. Behavioral treatment, such as Cognitive Behavioral Therapy (CBT), has seen extensive success in treating cocaine addiction in particular. This short-term treatment approach involves identifying thought patterns that lead to substance abuse and then working to change those thoughts. As a result, behaviors also change. Clients then learn to opt for positive coping mechanisms when triggers to use cocaine or other stimulants arise. Contingency Management, a form of therapy that involves rewards, has been shown to be effective in treating stimulant addiction. Clients are given rewards, like vouchers for activities or prizes, for achieving certain milestones, such as a certain number of days sober or attending a specific number of therapy sessions. The Matrix Model is also commonly used to address stimulant addiction. In this model, the client and therapist work closely to encourage positive behavior changes and boost the client’s feelings of self-worth. As treatment progress, clients gain more self-confidence and ultimately realize that they are best able to help themselves once they have the right tools in place. As with all forms of addiction treatment, care should be customized to fit the individual needs of the client. There is no cookie-cutter approach to recovery that will work for everyone, so those struggling with stimulant abuse should take care to find a treatment program that will address their specific needs.